The OpenSAMM 1.0 English XML source file has been converted into an eBook format by Paweł Krawczyk. We have a pervasive problem in our field. We lump two disparate classes of security weakness together. Some articulate the difference as “business logic” vs. “technical” or “semantic” vs. “syntactic”. I’d like to build on a familiar term to developers: “domain”. Each kind of software weakness is domain-specific or domain-agnostic (or both). Making this distinction is critical. We currently try to fix both sets of weaknesses with the same sets of tools, processes, and expertise when in fact they need to be treated differently. Our current approaches to application security work well for domain-agnostic vulnerabilities, but we need domain experts to solve domain-specific problems. 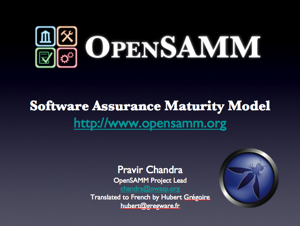 Thanks to Hubert Grégoire and Sebastien Gioria, we now have a French translation of the OpenSAMM 1.0 Overview presentation available for download. You can get it from the download tab or there is a direct link here. If anyone else has translated the presentation to other languages for local chapter presentations, please feel free to send them to me (or the mailing list) and we’ll get them posted for all to access. I’ll post slides and presentation details after we’ve got them finished. But it should be a good morning, and for those in Australia wanting to know more, this is a great session for free to come along to.! Yesterday Part 2 described how to create and validate the source roadmap data files. In this post, transforming the data files into the final SVG format we saw in Part 1 will be described. 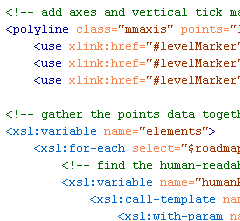 The great thing about having data in XML is the ability to translate it easily into another format using Extensible Stylesheet Language Transformations (XSLT). Download the archive of files. You also need the base US English XML file (version 0.3) for SAMM v1.0 and your XML data files. 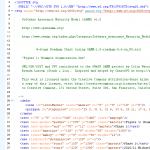 The archive includes the two example XML files from Part 1 (again) and the US English SAMM base XML file. Remember the latter should normally be downloaded from the SAMM download page. Place all the files in a new directory. Take a tool which can undertake XSLT conversions, and apply SAMM-1.0-roadmap-0.6-en_US.xsl to your XML file or one of the examples. An SVG file should be created. And that’s it. Alter your XML files to see the effect on the generated SVG charts. If you don’t want to use XML and XSLT, you can of course just edit the SVG files directly using some sort of text editor. 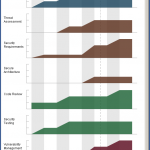 I hope to spend some time creating SVG charts for the SAMM scorecard charts sometime soon. Part 1 demonstrated the final generated SCG charts. Here we will look at the starting point—the source roadmap data files. 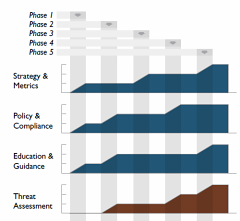 The roadmap charts describe changing level data across a number of implementation states. 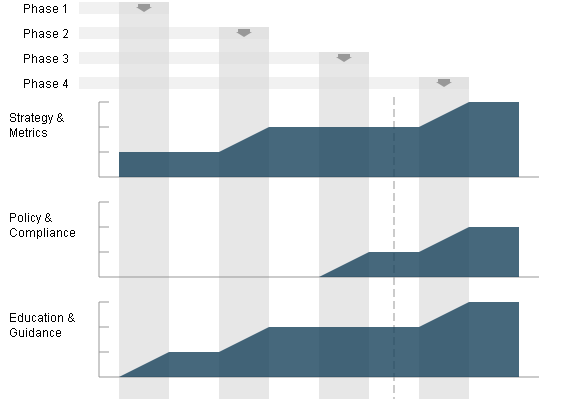 The charts are not project planning tools and therefore the durations are neither defined nor indicated in the widths on the charts. Maturity Level information can be 0, 1, 2 and 3 or where there is additional assurances in place beyond those indicated by the Level, the “+” symbol can be used so 0+, 1+ and 2+ are also allowed if required. For charting purposes these are treated as ½, 1½ and 2½. There is no assumption that Maturity Levels will increase through subsequent states; Maturity Levels can fall as well as rise, or remain static. Unlike in the previous spreadsheet version, the number of states (phases, steps or stages) which can be charted is flexible from 2 to 10. The greater the number of states there are, the wider the final generated chart will be. We will see below that your “states” can be called anything you want. 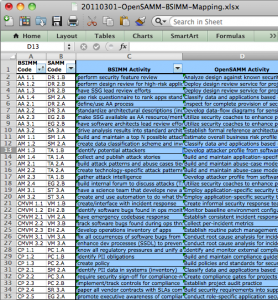 where the title (XML encoding) is used as a heading on the chart legend, and the Maturity Level data are included between the <states></states> markup tags. The first markup within the section must be the Maturity Levels at the start i.e. state 0 (zero). State 0 has a title (“Start” in the example below) and description, but these are not used or displayed. All security Practices that are to appear on the roadmap must be defined within the <levels> markup. 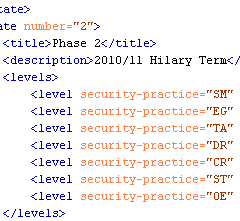 The values for the attribute “security-practice” must match the security Practice attribute “id” defined in the <security-practice> markup tag within the base SAMM XML file (e.g. 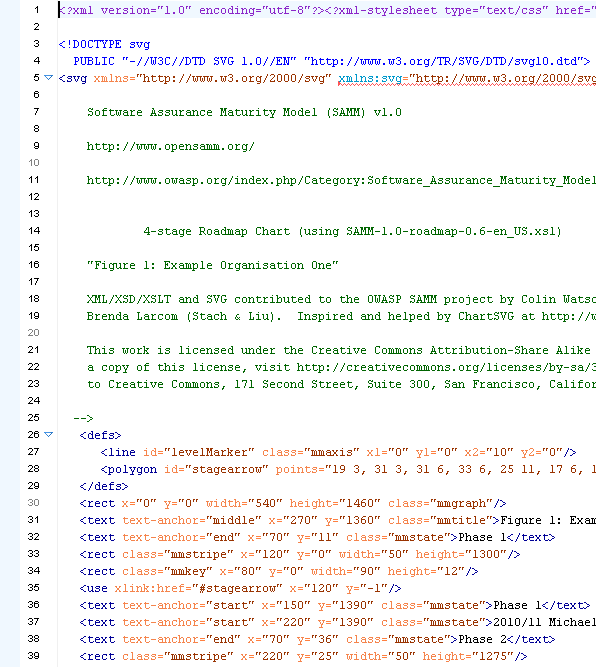 SAMM-1.0-XML-0.3-en_US.xml mentioned in Part 1). “SM” is “Strategy & Metrics”, “PC” is “Policy & Compliance”, etc. Subsequent stages are defined in the same manner. The file is saved with an XML extension. For the eagle-eyed amongst you, you might have noticed a vertical dashed line in the SVG example shown in Part 1, which doesn’t appear in any of the roadmaps in the SAMM document. This is a new optional attribute which can be added to one of the stages. Just add the attribute “marker” with value “true” in one of the <state> tags and the line will be drawn. This might mean "status now" or an important event on the timeline, but that can be described in your accompanying text or presentation. We tried the make the source data files as human-readable as possible, but thought we also needed to provide a way to validate the format. Firstly check the file is well-formed. The simplest method is to use the W3C Markup Validation Service to upload the file or directly input the file content. If your data contains confidential information, you may want to undertake this check locally instead. You will need some sort of XML tool for this. The XSD includes some assertion statements, and therefore needs XSD v1.1 enabled in a Saxon parser. It also has some Schematron statements which should be validated as well. Now you should have validated XML files. In Part 3 tomorrow, the automated process for transforming the source data into the final SVG files will be described. OpenSAMM documentation has a big design wow factor and SAMM users, such as development companies, auditors and security consultants, are often keen to mimic the style, especially the graphs. So, last year I developed a Microsoft Excel spreadsheet to help in the creation of roadmap charts. However it was a bit of a fudge to make the output look similar to the Adobe Illustrator versions in SAMM. The spreadsheet was difficult to alter if you had more than four stages in the roadmap, it was restricted to whole level values (not 0+, 1+ or 2+), and it included background images making it fiddly to edit. Open Office Calc didn’t seem to provide enough functionality to generate the charts, and Microsoft Visio is quite expensive, and even then I couldn’t make it format the data as required. Last year I was invited by David Rook to present SAMM at an OWASP Ireland chapter meeting in Dublin. After the presentation, I spoke with Eoin Keary (OWASP Board member) and we discussed whether a server-side option could be built which would be more flexible. But I had begun using Scalable Vector Graphics (SVG) for another project and realised these would be a better solution for creating the charts, since modern web browsers support SVG markup directly and it could all be created locally rather than using a remote service. segregate data (put the data in elements) from display options (put options in attributes). We spent the next couple of months bouncing ideas and files back-and-forth, and Brenda’s expertise meant we ended up with a much more compact file structure. SAMM project leader Pravir Chandra also helped by providing all the textual information from SAMM in an XML file. The base US English XML file (version 0.3) for SAMM v1.0 is currently available (SAMM-1.0-XML-0.3-en_US.xml in a Zip archive on the SAMM download page, adjacent to the PDF version). Save that—you’ll need it in Part 3. With one thing and another, it’s been a little while since then, but Pravir asked if we could share our efforts via this blog rather than using the mailing list alone. I’d like to begin at the end, and show you examples of the generated SVG files. So if you change the CSS filename or location, you must edit the SVG file (perhaps just using a text editor). You can of course customise the CSS file to alter the chart appearance. In Part 2 on Monday, the XML format for source roadmap data will be discussed, and in Part 3 an automated process for transforming that data into the final SVG files, like the one above, will be described. I have conducted, sold and project managed SAMM engagements to financial service (FS) organisations throughout Europe over the past years. It is obvious the demand is growing for such services. 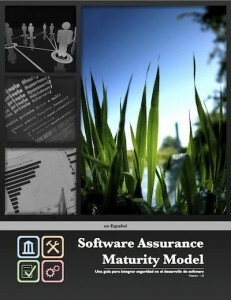 The rise in demand of “security@source” be it via code review, secure development or grey box penetration testing and a supporting framework to tie it all together and understandably so as SAMM is one of the first pragmatic benchmarking and assessment frameworks for the somewhat ancient “Security in the SDLC” challenge. The financial services industry is the perfect work stream for frameworks like SAMM. Financial services are widely known as the an area which invests heavily in areas such as information security, it’s heavily regulated (some say not heavily enough) and a daily challenge to FS is to maintain leading edge security but manage costs and usability whilst also being compliant with industry regulations, corporate governance and local/regional/global legislation. SAMM covers four domains which in turn have sub domains. These four “pillars” attempt to examine all aspects of software development, all external catalysts which may result in either making security more robust or result in weakness. It would be naive to assume SAMM is a “silver bullet” in terms of SDLC assessment but it is a very pragmatic solution to a rather complex ecosystem. The questionnaire is simple and effective assuming knowledge of secure application development as it can sometimes be open to misinterpretation. One of the key challenges in developing SAMM was delivery/authoring of the questionnaire. The risk being that individuals being questioned may misunderstand the questions. The key to an accurate SAMM effort is [in audit speak] to procure a decent “sample space”. Sample space is a function of the amount and the diversity [roles within the SDLC] of the individuals interviewed by the SAMM reviewer. Accuracy of the answers given is also important as you shall get divergence based on role within the organisation. Road map definition is also a challenge and knowledge of what are the focus points for the organisation being assessed are very important to develop the roadmap. [E.g. A financial services organisation may focus on regulatory and compliance issues but a software development house may not so much.] A principal benefit of SAMM is the ability to define a high level roadmap and drilling down into each activity in order to define what is required to reach the required SAMM level for a given domain. You are currently browsing the archives for the Discussion category.